Why is it that a swarm of ordinary locusts are genuinely fear-inspiring, but a swarm of locusts the size of a tractor-trailer is considered humorous? Whenever sci-fi of the 1950s is discussed, the topic often turns to giant monster movies, and from there it inevitably ends up with peals of laughter at "the one with the giant grasshoppers." That attitude was certainly taken by Mystery Science Theater 3000 when it riffed madly upon this oft-ridiculed picture. The village of Ludlow, Illinois is mysteriously flattened and every single soul vanishes in the middle of the night. Investigating reporter Audrey Ames (Peggie Castle) looks into the possibilities of atomic testing gone badly, but she's not far off the mark. It turns out that the USDA experimental station headed by Dr. Ed Wainwright (Peter Graves) has been using radioactive materials to develop tomatoes the size of beach balls and strawberries as big as a head. Of course, the fact that they're completely inedible hasn't discouraged him. But his housekeeping skills haven't been the best, since he has allowed snails, caterpillars, beetles, and locusts to get into the radioactive goop. Alas for Illinois, it turns out that Ludlow was destroyed by ravenous locusts, grown to gigantic size by the radiation. They now have their sights set on the tasty city of Chicago, and Ed (who also happens to be an entomologist) has to figure out a way to stop them from eating the Art Institute and everyone inside, not to mention the Monets. Director Bert I. Gordon is notorious for such giant monster movies, including The Amazing Colossal Man and The Cyclops. But its slightly wacky monster threat really propels it into motion picture notoriety; for some reason it comes off much sillier than the ants in Them! Part of the problem is the special effects work (also done by Gordon). When you consider the miniscule budget, they're not bad, but modern audiences will find them highly unconvincing. A variety of techniques are used, some ingeniously, including rear projection, matte work and, most infamously, having the locusts climbing skyscrapers represented by having grasshoppers crawl up a photo of the building! For its oddness, it actually turns out pretty well, considering. The leads are decent, with Graves making a good impression as the hero despite having a fairly obtusely-written part. Oddly, no one thinks of holding him responsible for causing this mayhem. Peggie Castle is spunky and makes the most of her part, standing up to the military authorities in a pretty surprising manner for a 1950s female lead. Morris Ankrum, Thomas B. Henry, James Seay, and Richard Benedict make up the quartet of military officials stymied by uselessness of their guns against the exoskeletons of the locusts. For the most part, they're pretty much by the numbers and not terribly impressive, though Ankrum has a decent presence and authority. Image Transfer Review: Image presents the picture in anamorphic widescreen and retains the original 1.66:1 ratio. The transfer is taken from the original negative, and other than some mild speckling the black-and-white picture looks very good. Greyscale is excellent and black levels are fairly good. There's plenty of detail and texture here. Although there's no significant edge enhancement, there is plenty of aliasing throughout. A higher bit rate or a dual layer presentation probably would have helped out in that respect. Audio Transfer Review: Although the keepcase describes the audio as stereo, it's really only 2.0 mono (and I don't believe this was originally released in stereo, so that's as it should be). The optical track used here is full of hiss and noise, and there's also an occasional electric buzzing sound that I found annoying. Music is rather tinny and thin, lacking in bass presence. However, for all that the audio track is impressive in rendering the shrill gigantic chirps of the locusts; it's piercing and very effective. Considering the low budget, one really can't ask for too much more. Extras Review: The principal extra is an amusing commentary with the then-wife of Gordon, Flora Lang, who assisted with the effects work, and his daughter Susan Gordon. The commentary is hosted by the enthusiastic director and writer Bruce Kimmel, who seems to be having a great time with the film. He does a good job of drawing Flora and Susan out with anecdotes about Bert's career and the making of the film, though he does have an annoying habit of finishing Flora's sentences for her and an overreliance on the IMDb. But there's plenty of interesting information and it's breezily paced with little dead time. Not a great commentary, but it's certainly more than I expected for this feature. Fans of the film will certainly be pleased. The only other extra is a set of the eight lobby cards for the film, programmed in a slide show. 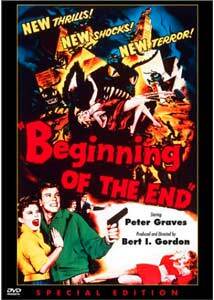 The giant monster movie that in some minds was the high-water mark of the 1950s trend in America hits DVD with a loving presentation featuring an entertaining commentary and an attractive transfer.